Having a baby is an exciting and scary time in a parent’s life. Learning that your child will need extra support brings up a range of emotions. Belle Children’s Services of St. Louis Arc is here to put you at ease. 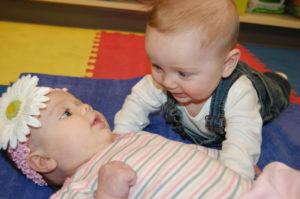 Our staff has years of experience working with newborns and infants with intellectual and developmental challenges. While some children require support for a few weeks, others may need a lifetime of support. Whatever the case, the St. Louis Arc is committed to helping for as long as there is a need. Providing education and resources about fetal alcohol exposure. Therapy and support for families with a child in the Neonatal Intensive-Care Unit (NICU).